Injuries to the pubic symphysis and pubic ramus are common. They occur in many sports and can be associated with pregnancy and following delivery. These injuries often cause severe pubic/groin pain and profound tenderness around the injured area. These injuries account for a great deal of disability and discomfort and are generally overlooked. Many athletes resign themselves to a permanent retirement, after several rounds of physical therapy are unsuccessful, but shouldn’t have to. Pubic symphysis injury is quite treatable, and typically resolved with Prolotherapy! Pain and injury at the pubic ramus and symphysis, while debilitating, are readily treated by Prolotherapy. The exam of the patient reveals marked tenderness at the injured site, either at the symphysis centrally or at the pubic ramus more laterally (and not uncommonly both). In fact, the tenderness is so substantial that many patients dislike the identification of the structures by palpation more than they dislike the injections! In regard to anatomy, centrally located are the pubic symphysis and the pubic symphysis ligament. 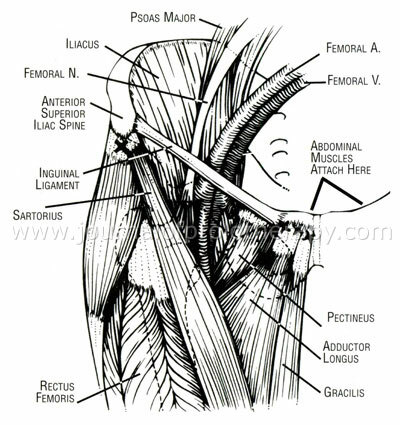 More laterally are tendon attachments of the abdominal muscles (superiorly) and thigh adductor muscles (gracilus and adductor longus muscles). (See Figure 1.) To begin treatment, discuss with the patient that you will be giving them injections in the “very low abdomen.” Also discuss that these shots are important to the resolution of their pain and restoring their activities (this part is very important because of what you are about to tell them next!). Shots into this area hurt a lot! Figure 1. Common injection sites for pubalgia. The attachments of the thigh adductors and abdominal muscles at the pubic symphysis and ramus are treated with Prolotherapy when tender. Used with permission of Beulah Land Press © 2001 Oak Park, IL. Prolo Your Sports Injuries Away!, fig. 21-14. The patient is then positioned supine with a pillow under the knees and the knees near each other. The drape is lowered to just below the pubic bone. The skin is cleansed. A few blebs of 1% lidocaine are infiltrated over the injured areas. Figure 2. 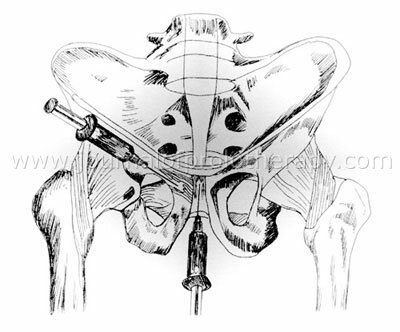 Injection of the pubic symphysis. Figure 3. Prolotherapy of the pubic symphysis. This is a very effective treatment for sports injuries causing groin pain. Used with permission of Beulah Land Press © 2001 Oak Park, IL. Prolo Your Sports Injuries Away!, fig. 21-10. Treating the pubic ramus calls for another 6cc of Prolotherapy solution for each involved side. Palpation can reveal injured tendon insertion sites. (See Figure 4.) While straddling the tender pubic ramus between my index and long fingers, the injections are administered by peppering six to eight injections to the pubic ramus at the points of tenderness. I will use appropriate caution for the femoral nerve, artery and vein which lie laterally at the inguinal canal. With knowledge of the involved anatomy and good technique, this is a very safe and effective treatment that routinely restores athletes and non-athletes alike to full activities without pain! Figure 4. 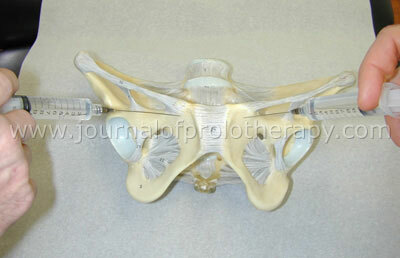 Model showing pubic symphysis and needles at superior pubic ramus.